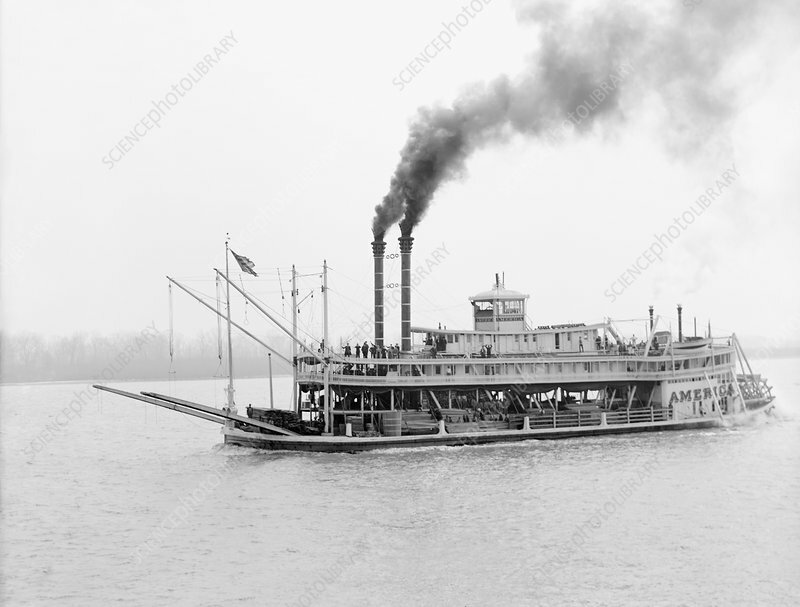 The America paddle steamer, on the Mississippi River, in Mississippi, USA. This is a sternwheel paddle steamer, with the paddle at the rear of the boat. Smoke is seen emerging from the smokestacks towards the front of the boat. The lower deck contains cargo, while passengers are on the upper decks. The wheelhouse is at the centre of the boat. There were several riverboats called 'America' during the 19th century and early 20th century. Commercial paddle steamers operated from the start of the 19th century to the 1930s. This photograph, from the Detroit Publishing Company, is from the period 1900 to 1910.